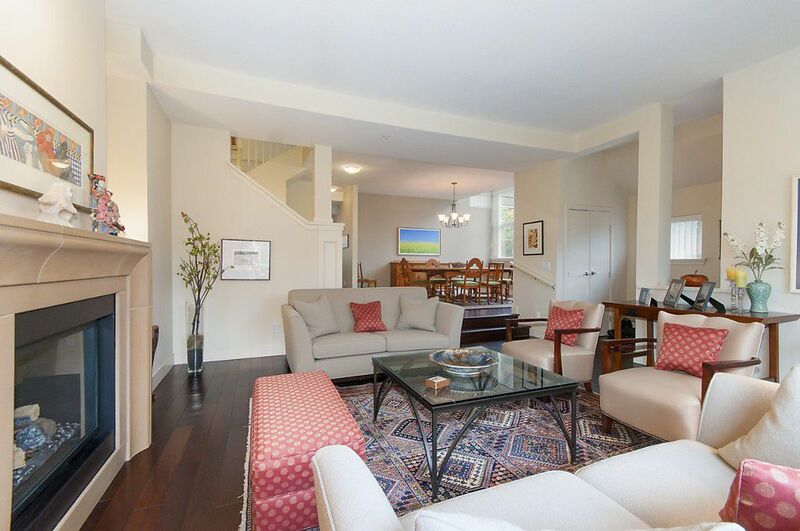 Spacious crner dplex in Chancellor Row @ almost 4000sqft that feels more like a single family house. SW exp, mtn views. Plnty natral light from 3 sides w/lrge wdws &skylights; high ceilngs, central air, lots of built-ins. Foyer &open concept lvng &dning rms. Kitch fts topoftheline apps, eating area &adjct fmly rm w/gas FP, French drs open to S. patio. Prvte outdr space. 3 bdrms on upper w/addtnl rm for 4th bdrm, hobby rm/flex space. Spacious library/office area. Mstr bdrm fts 5pc ensuite &walkin clst. Lrge rf top deck w/mtn views & outdoor FP. Lwr flr fts bdrm w/walkin closet, laundry rm, rec rm w/wet bar, wine frdge, mudrm off attchd 2car gated grge in undrgrnd prkg. INCREDIBLE space for strge. Close to Norma Rose Pt Schl, U Hill Elmntry & Sec, UBC, Spanish Bks, Rose Grdn & Chan Cntre.